Lighting ignited the Castle Rocks fire in the deep backcountry of Denali National Park and Preserve in early July, 2013. Over the next two months, the Castle Rocks fire would fluctuate between periods of activity and inactivity depending on changing weather conditions, eventually burning more than 12,900 acres by the time it was declared out on September 4, 2013. Remote even by Alaska standards, the Castle Rocks fire plotted approximately 100 miles to the west of Denali park headquarters and 160 miles southwest of Fairbanks. Throughout July and August, fire managers from the National Park Service (NPS) and Bureau of Land Management’s Alaska Fire Service conducted several visual reconnaissance flights of the fire using both fixed wing and rotor wing aircraft in order to observe fire behavior and generate maps of the fire’s extent. Additionally, fire managers used the recently launched Landsat 8 satellite to generate accurate fire perimeter maps for the Castle Rocks fire in a safe and cost-effective manner. Due to the large geographic extent and long duration of Alaska’s wildfires, maintaining current, accurate fire perimeter maps is always challenging in a constantly changing environment. With remote Alaska fires, it is often not possible to have “eyes on the fire” at all times. With this in mind, the potential to use earth-observing satellites as an additional source of fire monitoring and fire mapping information is of huge benefit to fire managers and the public who rely on current, accurate fire information. Fires in Denali National Park and Preserve are visible in red on this Landsat 8 image collected August 26, 2013. The Landsat image is displayed in false color so that the burned areas stand out better making it easier to delineate the fire perimeter. Landsat 8 was launched in February 2013 and became operational a few months later. Images collected from Landsat 8 are posted online at http://glovis.usgs.gov and are available for free download. Fire perimeters collected using Landsat imagery are accurate, timely and cost-effective. Landsat data is accurately geo-referenced and has an image resolution of 30 meters. While not a “high resolution” sensor, the 30 meter pixel size is more than adequate for mapping fires greater than 100 acres in size. Landsat data is also timely. Working in tandem with Landsat 7, a Landsat “scene” is collected over each area every eight days. However, because there is a great deal of overlap between Landsat scenes at far northern and southern latitudes, it is not unusual for the typical Alaskan fire to be imaged by Landsat two or even three times per week. It is also cost-effective to map fires using Landsat imagery. You can’t beat the price of the imagery: it’s free! 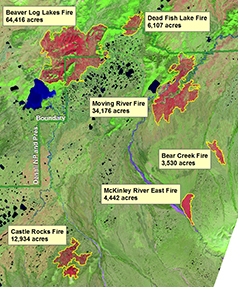 In addition to the Castle Rocks fire, Landsat 8 was used to generate fire perimeter maps for several other fires that burned during the 2013 fire season within Alaska’s national parks. As the 2013 fire season came to a close in Alaska, the regional fire management program again relied on Landsat 8 to generate final fire perimeters for nearly all of the large NPS fires. This was especially valuable because mapping with aviation resources at the tail end of the fire season is often a challenge due to inclement weather and the potential for reassignment of both contract aircraft and qualified personnel. Looking ahead to the 2014 fire season, it is reassuring to know that Landsat 8 will be available as another tool in the fire manager’s toolkit. This entry is filed under Fire, News.